Yao Ming Mania! • View topic - Vassilis Spanoulis: Yao Ming is My Idol ! 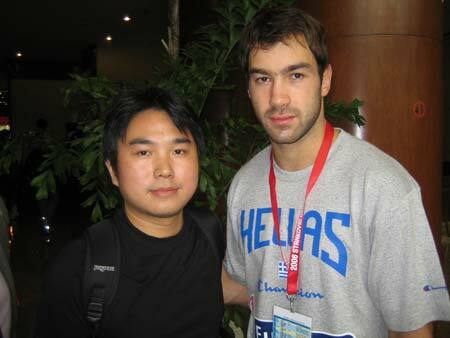 < Yao's teammates and coaches ~ Vassilis Spanoulis: Yao Ming is My Idol ! A short interview of Vassilis Spanoulis in Nanjing. Was he only polite to say that Yao Ming is his idol, just because he was in China talking to Chinese reporters ? Even though his name has been mentioned numerous time, just like the Greek national team, no one was familiar to who was Vassilis Spanoulis. So after checking from some of the accompanying personnel of the Greek national team, the reporter finally confirmed that the player with a trendy sunglasses was Vassilis Spanoulis. So as the newly joined member of the Houston Rockets for the new season, this 23-year-old point guard has all of a sudden become the box office drawing star of the Greek national team. 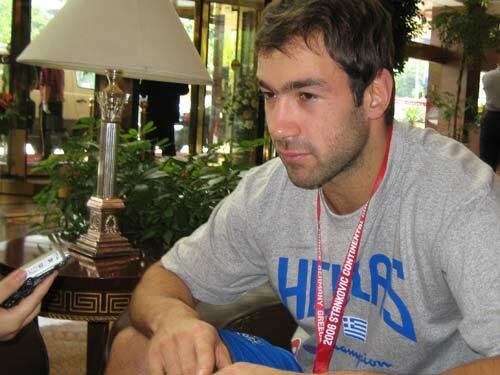 However, to the reporters, Spanoulis appeared to be pretty amiable. Therefore, in the lobby of the Nanjing Grand Hotel, while waiting for the arrival of luggages, Spanoulis, this mysterious new team mate of Yao Ming, received the following interview. Spanoulis was discussing with his team mates about what they saw and heard on their way from Shanghai to Nanjing when the reporter raised the request for an interview. So the opening remarks from Spanoulis was: "(Prior to my arrival), I knew China is a very large country. Now that I am here, I've discovered that China is also a very beautiful country." So after exchanging some casual chats with each other, the discussion between Spanoulis and the reporter was back to basketball. "Now that you have joined and become part of NBA, how do you feel?" "I have dreamed for this contract for the last 2 years." Spanoulis told the reporter that he had craved to compete in NBA 2 years ago when Houston Rockets acquired the right of him from Dallas Mavericks in 2004. But to his vast disappointment, the Houston Rockets decided to leave him in Europe to play in the Euro League. "To tell you the truth, I was pretty depressed at that time. But now my dream has finally realized." "So do you know much about the Houston Rockets ?" Regarding this, Spanoulis indicated: "Let me put it this way. Even though I played in Europe, I stayed close to NBA, and particularly, the Houston Rockets. The Rockets did not have good results this previous season, but I don't think this truely reflects their true strength. It was mainly because of injuries and sicknesses, and bad luck too. In my mind the Houston Rockets should be a championship team, as we have 2 super stars in Tracy McGrady and Yao Ming." As Spanoulis casually menitoned Yao Ming, the reporter just took advantage of the opportunity to press in with a question which he had prepared well in advance: "So have you watched Yao Ming in action ?" "Of course, I have" Spanoulis responded affirmatively. "Prior to the 2002 draft, I have already watched him play. And because he is the first ever international player in the NBA history that got No. 1 draft, he has been the inspiration for us, the international players. Therefore I have always followed his games." "So can you tell us what is your impression of Yao Ming ?" "Oh, I have never met him before. All my impression and understanding of him is just entirely from what I saw of him on the court. I thought he is an extremely outstanding player, and he has become a very well-known centre in NBA. In my eyes, he is absolutely a super star. I adore him very much." "Although you have already become his team mate, it looks like you have not met him before. So do you anticipate meeting him this time round?" Upon hearing this question, Spanoulis scratched his head, and said: "Of course, just like that I want to meet each of my Houston Rockets' team mate." Then Spanoulis immediately supplemented to what he said: "But I surely don't want to meet him on the court this time round. I don't want to play against him prior to us becoming team mates. He is my idol." Viewed as one of the fastest rising point guards in Europe in the past 2 years, Spanoulis averaged 14.5 points per game, 3.1 assists per game, and 1.4 steals per game in the Greek league in the previous season; his field goal percentage and 3-pointer percentage were 61.7% and 36.7% respectively. Therefore he is widely viewed by the the general fans to be the effective prescription to resolve the current sluggish back court problem of the Houston Rockets. Some fans even called him "the European Kobe". When the reporter told Spanoulis about his new nick name, the shy Spanoulis, all red in his face, just muttered: "This is too exaggerated, just far too exaggerated." After calming down, Spanoulis just indicated very modestly that he was very happy to be elevated to the same altitude as Kobe Bryant. "Kobe is a great player, and I am just a rookie of NBA. I feel that I have yet to earn that nick name. Maybe I played pretty well (in Europe) these 2 years. But I know deep down inside my future role in the Houston Rockets. The Houston Rockets have many good players. My job is to make them better. I only hope my joining will bring new impetus to the Rockets, and better still, a little bit more of luck." Spanoulis smiled broadly. Great translation, as always Pryuen. I appreciate your time and effort. Wow, this is great news. I'm pumped up about the team chemistry we'll have next year This is, after all, Yao's team now. Players should mold around him, not the other way around. With Spanoulis, I think we're one step closer to playoff contention. Thanks pryuen as always. I head that van dumby isn't too fond of him though, but I do hope he will get teh minutes to prove himself. BTW, the guy in the blue shirt behind them has a haircut that's so 90's (parted hair down center)... lol. are you sure it's a woman? could be a smiling effeminate man? At least Vassilis understand his future role in Rox team, it's good for the team chemistry. most international players are unselfish. we are just so used to the egos from non-international nba players. international teams don't win with superstars...they are team players. just think of all the international players in the nba? i don't see any selfish jerks. Hmmmmmm, let me see if I can squeeze in 2 hours during my lunch break this morning to provide you guys another translated interview of Spanoulis by the above reporter from Sina Sports. Wow, thanks pryuen! You have a long lunch break. Eating lunch in the morning?